Three years ago this summer, you warred with the cruelest of enemies–depression. He was a sinister thief of your thoughts. He tried to make you unrecognizable even to those of us who knew you best. He made it difficult for you to eat, sleep, and enjoy all that you loved in this life. He tried to convince you that you weren’t worthy of love from other people, and especially not from God. He worked hard to confuse, belittle and enrage you. He tried to tear you down. You ended your own earthly life–and so by human standards, depression won. Not by God’s. 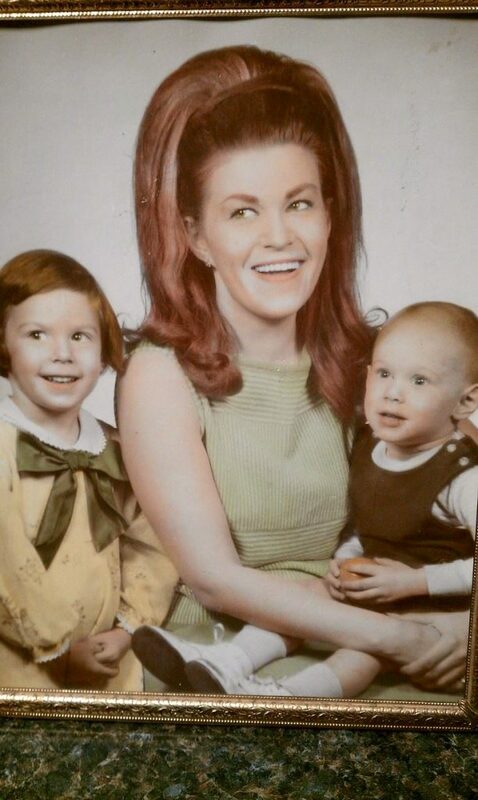 You were about 2 years old here, at right, with Mom, center, and Lisa, at left; circa 1968. After you had passed, a few people suggested that deliberately falling on your own sword is akin to the unpardonable sin. I disagree. I’m convinced those people haven’t had a front-row seat in the unsettling theater of mental illness. They don’t understand that depression can be as unwieldy as cancer. You’re in heaven now. I never once doubted that you’d land there. Our gracious and loving God offered me glimpses of that truth in the months after you died. It is by his grace that daily you’re with me, the fabric of your spirit fastened to my heart and memory. Your life wasn’t a fleeting flash in a pan. Your life is eternal. It continues to dwell and impact me–and countless others. On the third anniversary of your death, I still wish you were here. You left behind many who love and need you. Yet my life is full. One source of joy is the memory of you and our many times together as friends and siblings. I live in praise of that gift. I quite agree, Bambi. Human perception of mental illness is often askew. That has seeped into all crevices of our culture, religion included. My brother didn’t ask for depression any more than my mom asked for advanced breast cancer. Mental health deserves more attention and respect than it gets. I’m thankful God has placed on my plate the opportunity to fight for it as a cause near and dear to his heart. This day I will always remember not just what take places. This day I lost a real friend and a great mentor to my son Anthony. We Love You and Miss you so much!! What a beautiful testament to Jim’s life and legacy, Latoya–thank you for sharing. I’m grateful God brought you, Anthony and Jim together. How lovely that Anthony dedicates his sportsmanship to Jim–he would love that, as you know. As you say, it’s not how Jim died that stays with us. What lasts is his spirit, his ferocious dedication to all that is good and true. God bless you, Anthony and your family, always.